Lithuania and Japan have agreed to cooperate in the development of nuclear energy and to share experience in this area, informs LETA/BNS. 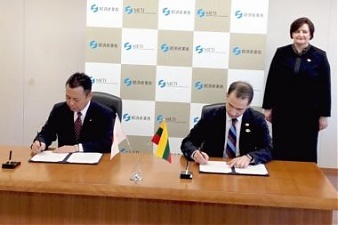 Lithuania’s Energy Minister Rokas Masiulis, currently on a visit to Japan, and Japan’s State Minister of Economy, Trade and Industry Yosuke Takagi on Tuesday concluded a memorandum of cooperation. “The agreement signed will help improve the abilities of our nuclear energy experts, to raise awareness of nuclear energy and its safety,” Masiulis said in a press release. “Moreover, Japan has ample experience in the area of pumped storage plants. We’d like to gain better knowledge of this experience and to use it with our Kruonis Pumped Storage Plant (KPSP). At the same time, Lithuania’s companies are competent in solar energy and implement solar energy projects successfully in the Asian countries,” the Lithuanian minister added.